What Is DEFCON 5 Or "Fade Out" Warning Level? DEFCON 5, also called "Fade Out" or "Blue Alert" is the lowest or normal state of readiness. 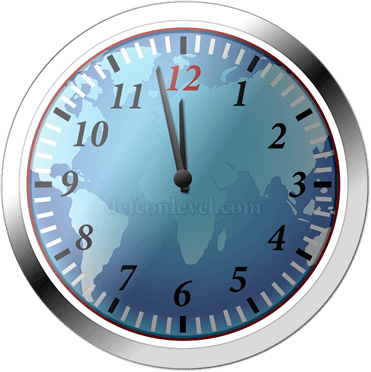 Level 5 means we are at a complete and total state of peace and have no immediate need to be on a high state of alert. The alert color for DEFCON 5 is blue. 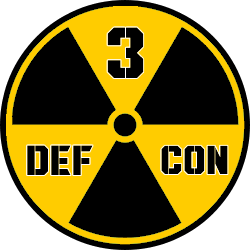 Some people have mistakenly believe that DEFCON 5 is the highest state of readiness and that level 1 is the lowest state of readiness. This line of thought has been driven into popularity as a result of movies depicting 5 as high alert and 1 as normal or peaceful status. The opposite is true however. Level 5, or blue alert is the lowest and level 1, or red alert is in fact the highest alert condition possible.